Samsung is going full steam ahead with its 14nm fabrication process and is now applying it in the manufacture of the new Exynos 7 Octa 7870. This new homegrown processor will be finding a home in Samsung’s next generation of mid-range mobile devices and should be appearing later this year. 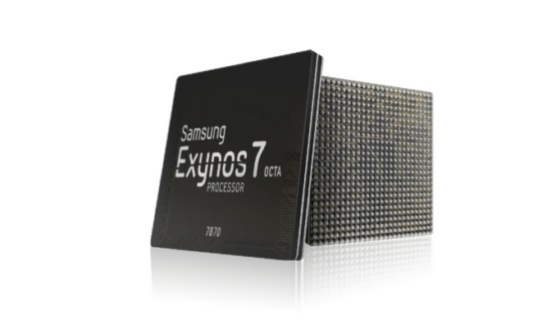 The Exynos 7 Octa 7870 features eight 1.6GHz Cortex A-53 cores and an LTE CAT.6 2CA modem which supports download speeds of up to 300 mbps. The processor supports 1920 x 1200 WUXGA resolution displays, which seems to indicate that Samsung will be bumping the specifications on its mid-range line of smartphones. Most importantly, the 14nm manufacturing process also allows the Exynos 7 Octa 7870 to consume 30-percent less power than 28nm processors. As a mid-range processor, we exepct the Exynos 7 Octa 7870 to appear in non-flagship designs like Samsung’s A-series of smartphones. That being said, it will interesting to see 14nm processors wind up on non-flagship devices so quickly. This could be a sign of things to come from Samsung, and it might allow it to better compete with the influx of Chinese devices that have flooded the market.